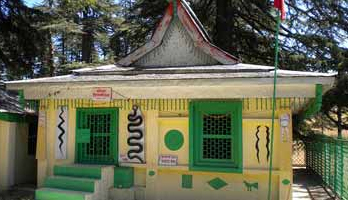 Situated in the heart of the popular Naldehra Golf Course, Mahunag Temple is set at a striking elevation of 1830 meters above sea level. 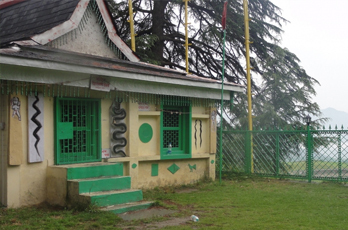 Dedicated to Mahunag, this temple lies on the Shimla-Mandi highway . It overlooks the stunning Karsog Valley on one side and the northern Himalayas on the other. History of Mahunag Temple The Mahuag Temple was constructed in the year 1664 by Raja Shyam in ancient Pahari style. It is believed that whenever the devotees are in danger and need the blessings of Lord Karna, he becomes a bee and rushes to assist his devotees. His blessings help to solve the family and legal issues of devotees. Offering at this shrine are made in silver for the lord. A large number of devotees and worshippers visit the temple every Sunday to worship the presiding deity. A huge fair is held every year on Makar Sankranti day. So, travel to Naldehra and visit the ancient temple of Mahunag and get bewitched by the grand view of the magnificent Himalayas. The temple remains open from early morning till evening and the best time to visit this temple is from February to November. Fairs and Festivals Nag Panchmi is a famous Hindu festival related to the serpent God; the festival is held on the fifth day of Shravana according to Hindu calendar. On this auspicious day, devotees throng this place to offer milk to Lord Anant Shesha.